Lucretius | Vorwärts und nicht vergessen! Lucretius lived from 99-55 BC. His birth date is not certain, and little is known of his parentage or birthplace. 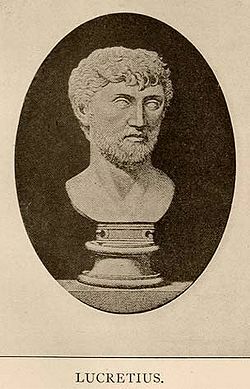 Though often referred to as Lucretius, his official name is Titus Lucretius Carus. Highly educated, he belonged to the aristocratic sector of the Tricipitini, which often emerged in positions of official status. He craved to free humanity from its unhappiness, which mainly resulted from fear of the afterlife and the gods. He was a moralist and a reformer as well as a scientist, and yet always a poet. His major work, ‚De Rerum Natura‘, sought to do this, borrowing from the work of Democritus, who discovered primitive atomic theories, and Epicurus, who believed that pleasure was the main goal of life. The philosophy of Epicureanism sprung from his beliefs. In order to achieve this goal of ultimate happiness, the gnawing fears of humanity had to be erased. Lucretius denounced religion as the greatest source of human corruption and anguish. The gods, rather than being a driving force in everyday life, were a model to strive towards. I’m often searching for brand-new articles in the internet about this subject. Thanx!! I inaugurate this despatch to be very useful. I am using it in a instrument I am article at college. Thats fine. It would be nice if you send me your article to complete my site. I inaugurate this collection to be rather useful. I am using it in a report I am scribble literary works at college. I have been hunting for the similar posting like this. You have made my day. Only one thing is going on in my mind at this moment and that is giving my comment as a way of showing gratitude.And yes i have book mark your site antiregierung.wordpress.com .